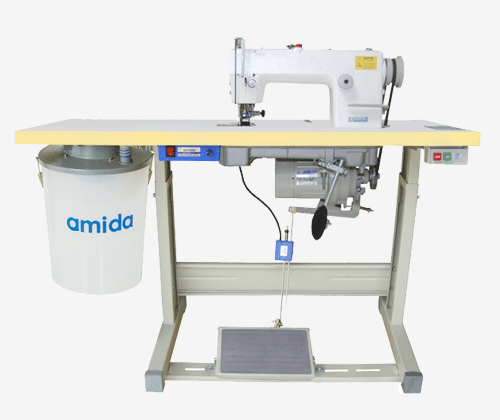 "Thread suction is essential for removing excess thread from the finished fabric "
Amida's thread suction device is also known as a lint collector device and is commonly used on overlock machines as an additional attachment on the machine. They can be used for any brand of overlock machines available today. They are very reliable because of their advanced mechanism and material construction with complete warranty and guarantee for one year through IIGM's Prefered Service Programme. Creates a better environment by removing strongly stuck up cutting waste and fine dust generated during sewing, providing a clean and comfortable working condition and total quality control. Lowers cost by saving time and labor while also allowing your machines to run efficiently and giving them a longer life. Easy installation and is suitable for all brands of overlock machines. You can also choose to install an auto presser foot lifter (PL Device). For the electric model only, one can easily move and provide suction to two machines at the same time especially made for small tables or compact factories. *NOTE: The Swirl motor does not need regular maintenance and a separate installation between the swirl motor and plastic container protects the motor at higher speeds.